Ya know sometimes I don’t get these designers. I mean what would’ve incentivized making a crystal Pokemon into a dragon? How does Necrozma become this thing? I’d be lying if I said it wasn’t cool, just kinda comes out of nowhere though. Ultra Necrozma-GX is a Dragon Basic Ultra Beast GX, 190 HP, with a Fairy Weakness, no Resistance, and a Retreat Cost of 2. Its first attack, Photon Geyser, is a 2-for-20 move, costs a Psychic and a Metal Energy, but then it asks that you discard all the Psychic Energy off of it to deal an extra 80 damage for each one. For the same cost, Scorching Light GX can put 6 damage counters on each of your opponent’s Pokemon, but you can’t use it until there are 6 total Prizes left or fewer between both players. If you’re like me, you get cynical around cards like this that have such weird Energy costs. I ain’t just talking about the actual Psychic-Metal Energy cost, although I can understand that they did that cause there are some scary cards in this set that already make Ultra Necrozma-GX that much scarier, but why does it discard only the Psychic Energy? You’re okay with putting on this weird Energy cost, but you’re not okay with discarding all your Energy willy-nilly? It’s so technical! It’s so specific! Just why is that?! Not the point. Photon Geyser is pretty much exclusively the main appeal of Ultra Necrozma-GX. It’s not that Scorching Light GX is bad, especially considering as far as a mid-to-late game attack it’s likely to make things an uphill battle for your opponent when their Pokemon are that much easier to KO, but let’s be honest – 60 damage is not that much. Granted, it is enough to KO a few evolving Basics, which could net you Prizes and potentially win you the game, but that is relying on your opponent to be a little…careless once they see Ultra Necrozma-GX. Photon Geyser in the meanwhile doesn’t even need that much Energy to deliver crushing amounts of damage. 2 Psychic Energy deals 180 damage, enough to KO most things in the game, while 3 Psychic Energy will deal 260 damage – enough to KO anything in the game! So it’s probably good the worst thing you have to deal with is something that puts a Psychic Energy on Ultra Necrozma-GX once per turn. The better question though might be why I didn’t put this guy in my own Top 10 list. Cause he definitely made it on some other people’s Top 10 lists! The thing about it might be that Ultra Necrozma-GX…well, it’s actually those Energy costs that throw me off the most with him. Granted, he’s got a lot of perks for what he offers, and explosive amounts of damage for relatively low Energy can be devastating…but lemme think on how Ultra Necrozma-GX actually gets to these Energy amounts. A Beast Ring can instantly get him the two Energy he needs and let him dish out 100 damage, minus an attachment from the hand for 180, and that puts you in a good spot. But then what? You’re not planning on just dealing 100 damage each turn till you win, do you? Where are you getting that Psychic Energy from? The discard pile? Your deck? And then are you planning on holding off one attack to Scorching Light GX your opponent’s field? Are you switching back and forth with another for consistency? What cards are you using to switch it around? And are you having to use the Retreat Cost? Any Ultra Necrozma-GX deck that can answer these various questions will likely do better in competition than any who can’t. Beyond that, it’s a matter of if the deck itself has consistency enough to match with the likes of cards such as Buzzwole, Zoroark, or even Dusk Mane Necrozma. It could be the next Rayquaza-esque deck, or it could be a flop – only time will tell. Arora Notealus: Ultra Necrozma is an interesting card to say the least – it’s at that point of design where the balancing tip is so fragile. On the one hand, the awkward Energy cost and requirements make it so that his damage output is limited, but on the other hand, he couldn’t be only one Energy cost. Psychics got a big boost in this set, and Metal decks just got a ton of support in the last set, both of which Ultra Necrozma could potentially have abused if it was just one or the other. Kind of an interesting conundrm, eh? Side Reviews: Passimian – there are some variations on what Passimian to run at the moment. I’ve 1-3 splits, 2-2 splits, 3-1 splits, the works. It’s not that this deck isn’t crazy in its damage output, but it’s got the unique disadvantage of losing power with Prized Passimians. It’s something though, definitely a fun deck to try out, but as far as Fighting decks with consistent power points, there are other better, bulkier options. Giratina <Prism> – I still don’t think that Giratina <Prism> has that much going for it, but he’s seeing a little play in some decks. I think the most unique one I’ve seen is a Mewtwo Psychic Box deck – it’s basically Big Basics with Psychic EX/GX that utilize a lot of different powers to overwhelm opponents. It’s something at least, though competitive is not one of those things. Weekend Thought: What were your thoughts on this week’s cards? Think some should have been higher on our list? Think some should’ve been lower? Think there’s a card that didn’t make the list? What decks could you utilize these new cards in? Next Time: And you thought we might be done with Ultra Beasts, HAH!! Our sixth best card of the set is Ultra-Necrozma GX, which seems to be the postermon of Sun and Moon Forbidden Light expansion. It is labeled as an Ultra Beast, which may be significant when it comes to support and counters, on top of other attributes being presented on a card. Being a GX Pokemon means giving up two prizes when one is Knocked Out as well as being supported or hindered by certain cards. Something unusual for a GX card is that it has just two attacks, one regular attack and a GX attack. Being a Basic Pokémon means less space from your deck as well as being easy to play, can be on the Active spot at the start of the game, and tap on some Basic support. At the same time, anti-Basic effects exists. It is also a Dragon type, which doesn’t hit any Pokemon for double damage sans other Dragons from BW sets. 190 HP is on the happy side of what the par is for Basic EX/GX Pokemon, though the Fairy weakness hurts; it won’t take much for Gardevoir GX to OHKO with minimal resources needed. And a retreat cost of two is mediocre. Then we get to the attacks. 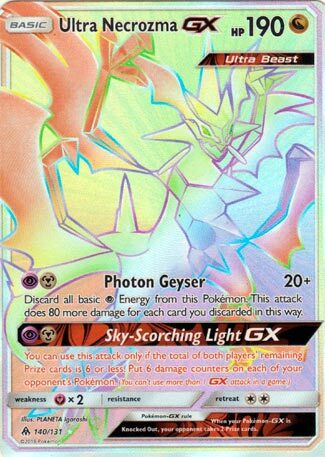 Photon Geyser costs PM for 20 damage, plus 80 more for each P energy that you’ve discarded from this Pokémon, and you have to discard all P energy first. The damage output for this attack is insanely generous. Between Beast Energy and Choice Band, you can reach high numbers for minimal discard. In this case, discarding two Psychic energies will become 240 damage after Beast Energy and Choice Band is factored in, which is almost an OHKO on any card in the game! Sky-Scorching Light GX also costs PM, and you can use this attack only if the total of both players’ remaining Prize cards is 6 or less. Put 6 damage counters on each of your opponent’s Pokémon. Which designates this attack to being mid to late game. This is also a phenomenal GX attack: this can chiefly KO almost all Evolving basics less than 70 HP as well as Night March! It also bypasses Mr. Mine Bench Barrier ability, but Machoke’s daunting pose still blocks it. Overall, very well worth those attacks despite lacking a third effect text. So how do we use Ultra-Necrozma GX? Well, couple partners that come to mind is Metagross-GX and Malamar. Both Pokémon can recover Psychic Energies. I find Metagross-GX to be easier than Malamar because you can attach energies from the discard to any of your Pokemon. Malamar can only do it in the Bench, requiring some lopsided maneuver like Dawn Wings Necrozma GX and Float Stone. Despite Metagross-GX giving up an extra prize, it is still more than twice as bulky than Malamar and it diversifies weakness. Plus, it can act as a secondary attacker in case Ultra Necrozma GX goes down and perform a revenge KO against Fairy Pokemon. These partners can help you continue using Photon Geyser while potentially dealing more damage dependent on partners in play. So that’s how I think Ultra Necrozma GX would be used. In Limited, if you pulled one, you’ll run this. Malamar happens to be one of the prerelease promos that you can pull, so you could do a mini-deck of a real archetype. And since you start the game with 8 prizes instead of 12, that GX attack can be used much sooner. Notes: Ultra Necrozma GX is a pretty good beatstick that has the potential to OHKO the majority of the cards. And it’s fairy weakness can be handled by other partners. Ultra Necrozma GX (FLI 95) descends into the meta from the Forbidden Light expansion set. And my last two wins were BOTH against Fairy decks (shhh the secret is Mew… use Mew to copy Photon Geyser… plus use Dawn Wings to attack with Moon’s Eclipse, especially if they Guzma and KO one of your Ultra Necrozmas to take a temporary lead). Mew also OHKO’s a Buzzwole GX with only a single Psychic energy but does unfortunately require two to OHKO Lucario GX (again a good time to use Dawn Wings). But seriously you want to go climb the ladder, this deck is really good. It’s not perfect – it is very reliant on Dawn Wings, which causes most Zoroark GX players to drool and hyperventilate a little when they see DW played down (they’re just happy that they get to target someone for weakness for once. Really, DW is literally the only Pokemon in the meta right now that is weak to Dark). It’s also very susceptible to Garbotoxin. I haven’t seen Garb in a while – I have to actually go back all the way to April 26th (more than two weeks ago and well over one hundred matches played) for the last time I played against Garbotoxin Garbodor. And yes, even though my last two wins were against Fairy decks, there are enough good Fairy decks running around that I’m pretty sure I’ll be happy to go fifty fifty against most Fairy decks. I’m actually 5 W 2 L with my Silvally GX Xerneas Break deck, and I didn’t actually play any of those matches against Ultra Necrozma GX. I come across a couple of good Fairy box decks, and as more and more Ultra Necrozma GX’s get into circulation, expect the number of Fairy decks to increase proportionally. But still I’d highly recommend this deck. I know Ultra Necrozma GX is super expensive right now and probably won’t come down anytime soon. I did play my first couple of matches with only two Necrozmas, using the Mews to copy Photon Geyser, so you might be able to get away with just two Ultras (and maybe even one if you throw in a Necrozma GX (BUS 63) or two). I’m still developing the list, too, I could see myself moving down to a 3-3 Malamar line and maybe dropping the Lunala Prism or one of the Mews. The good thing is that you actually don’t want to run a bunch of Leles in this deck as you don’t really have the bench space for them, so it’s a little bit of a budget saver there. This was my number one card. I did watch a number of videos with people testing it ahead of time, and I could tell it was going to be bonkers. It’s going to mow down opponents for a while, and I would expect it to be very popular and very effective throughout the rest of this season and beyond. Time for Necrozma-GX PLUS ULTRA! Just be glad I can’t draw or even use image editing software competently: it occurred to me one could have All Might just using a Necrozma named “Beyond” to really sell the joke. Well, unless you don’t know MY HERO ACADEMIA, in which case you don’t know what any of this is about. Our 6th place finisher is Ultra Necrozma-GX (SM – Forbidden Light 95/131, 127/131, 140/131), who appeared on four out of five of the individual Top 10 lists for a total of 86 voting points. That is a full 14 points above yesterday’s 7th place pick but missed tying 5th place by 7 voting points. The gap between 6th and 7th is the biggest on the list, which may mean something or nothing at all, but I found it interesting so I figured I’d state it plainly. Ultra Necrozma-GX is my 5th place pick, and I’ll explain why. If you don’t recognize that name, maybe you weren’t around when that deck was competitive or you just knew it by another name. Rayeels was built using Rayquaza-EX (BW – Dragons Exalted 85/124, 123/124; BW – Black Star Promos BW47) and Eelektrik (BW – Noble Victories 40/101). Eelektrik has an Ability called “Dynamotor” that allows you to attach a [L] Energy from your discard pile to one of your Benched Pokémon once per turn before you attack. Rayquaza-EX is a 170 HP [N] Type Basic Pokémon-EX that can use its “Dragon Burst” attack for [RL], which allows you to discard either all basic [R] or basic [L] Energy attached to itself and do 60 damage per Energy you discard in this manner. Ultra Necrozma-GX has 190 HP, and even adjusting for the power creep that’s still sturdier. Its first attack is “Photon Geyser” for [PM], which has you discard all basic [P] Energy attached to itself and does 20 damage plus another 80 damage per [P] Energy you discarded. Malamar (SM – Forbidden Light 51/131; SM – Black Star Promos SM117) is nearly a [P] Type Eelektrik. Use proven tactics, and you have a solid chance of swinging for 180 to 260 turn after turn. There’s more to it, but I need to keep this relatively short, so we’ll focus on the highlights. Ultra Necrozma-GX doesn’t have a fallback attack that can accelerate Energy to itself, but it has a potentially useful GX-attack in “Sky-Scorching Light-GX”. The attack states you cannot use it unless the sum total of both players’ Prizes is six or less. If it is, Sky-Scorching Light-GX places six Prizes on each of your opponent’s Pokémon. Is Tapu Lele (SM – Black Star Promos SM45) finally out? The spread might be useful without it, but if you can easily move around the damage counters, this can set up a solid combo. Ultra Necrozma-GX doesn’t have the more affordable Retreat Cost of Rayquaza-EX ([CC] versus [C], respectively), but just as Rayeels would run Keldeo-EX with Float Stone, this deck can Dawn Wings Necrozma-GX with Float Stone and have a pivot Pokémon capable of promoting itself via its Ability. Dawn Wings Necrozma-GX, unlike Keldeo-GX, attacks using the same Energy that fuels the deck’s main attacker, which is not essential but useful. So… yeah. I don’t know if this will be the new top deck, but it looks great to me. This applies to both Standard and Expanded, but please note for the Ratings that Ultra Necrozma-GX owes a lot to the available Energy acceleration; it would be near useless if you had to rely on only manual Energy attachments. For the Limited Format, I’d be tempted to run it as a +39 deck; the GX-attack will be legal to use more quickly and your opponent may still be stuck with several low HP Evolving Basics at that point. Even if you are relying on Photon Geyser, you can do 100 per turn starting on your deck turn, and that should take four Prizes quite quickly. Oh here we go. The poster boy of SM Forbidden Light. He carried the beatstick potential as his distant cousin, yet functions still all the same. Its Ultra Necrozma-GX! Our new monstrous beast stands tall, but not that bulky as it is a Basic Pokemon-GX sitting at 190 HP which is indeed at the higher spectrum when we talk about health levels for this category. Its a Dragon type which is weak to Fairy, but its not Necrozma’s biggest niggle as it basically a life and death style attacker, so it doesn’t care about the type matchups as much. Speaking of which the Dragon type doesn’t give it type advantages over anything in modern history, so it is as useful to it as Ultra Necrozma being a Colorless type. A retreat cost of 2 isn’t good, but we do have ways to circumvent this. There’s a unique thing about this Pokemon though, and it is the fact that Ultra Necrozma-GX is our first Pokemon-GX with only two attacks and nothing else. Usually Pokemon-GXs are either between having 2 regular attacks and a GX attack, or having an Ability, one regular attack and a GX attack. So the 2 attacks has to be good to justify this break of events. Since both its attacks costs [P][M] there is little to discuss about trivial energy costs, so I’ll jump right to the attacks. The first and most defining attack of Ultra Necrozma-GX is probably Photon Geyser. Having a base of 20 damage may seem small, but it actually gives 80 extra damage for each Psychic energy you can discard from this Pokemon. Basically an improved and slightly trickier version of Necrozma-GX (SM BUS)’s Prismatic Laser, its scaling is truly off the charts and can actually nuke all sorts of Pokemon in the meta. The Dragon typing in this case becomes more of a blessing than a curse – without type chart disadvantages, Photon Geyser becomes much more a threat as it can deal flat big numbers without anything to hold it back but its own energy management. Add in Choice Band and Beast Energy, and you can truly see how much can Necrozma hits. The GX attack, Sky-Scorching Light GX can only be used if there is a total of 6 prizes remaining on the field (the sum of yours’ and your opponent’s) but it applies 6 damage counters on each of your opponent’s Pokemon. This GX attack in its base kit does seems counter intuitive against Ultra Necrozma’s main job of one shotting everyone, but a last resort attack that can either start chipping up damage or finishing its mission from the back lines are what this GX attack is meant to do. However, I still consider the original Necrozma-GX’s Black Ray GX to be the more superior option as it really puts a dent into many 2 prize Pokemon, allowing Ultra Necrozma to complete its job for as little as 1 Psychic energy. Partners? Ultra Necrozma-GX is a card that, like Dusk Mane Necrozma-GX requires full team support to run effectively. Partners like Malamar FLI, which can recover Psychic energy discarded by Photon Geyser all as a 1 prize Stage 1 Pokemon, Metagross-GX which can do that and more, being a Metal type that hard checks all Fairy types with its sky high 250 HP but as a Stage 2 Pokemon-GX, Dawn Wings Necrozma-GX and Altar of the Moone combo as mobility options in the Malamar variant to provide mobility and retreat any Necrozma back to the bench to be recharged (rinse and repeat), and so on so forth. One must be wary of Ability lock however, as Ultra Necrozma decks are very weak to ability locking. In short, Ultra Necrozma is a unique specimen – a powerful beast with controllable damage scaling depending on the situation and a Dragon typing that blesses it instead of cursing it overall. But being weak to Ability lock and a weird base kit does puts it off the radar. However, don’t be fooled – this card does live up to its name as an Ultra Necrozma.